No matter what climate you live in, the temperature throughout the year varies. For some climates that means blazing summers that cool to frigid winters. What many people don't realize is that the temperature below ground (regardless of climate or season) stays fairly consistent all year. The ground is able to maintain a higher rate of temperature consistency because it absorbs 47% of the suns energy (heat) as it hits the Earth's surface. 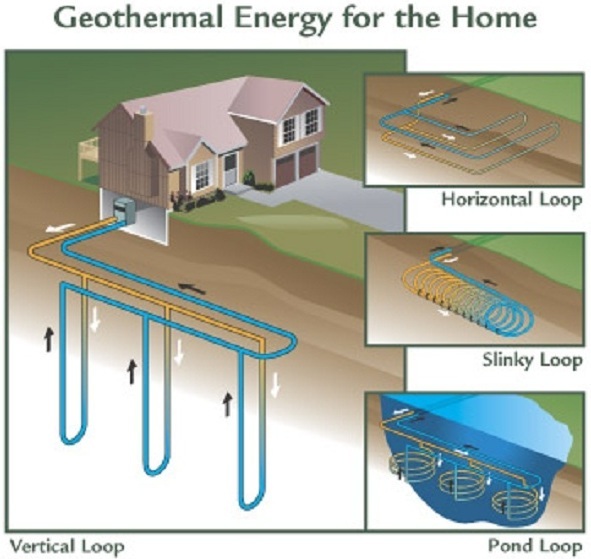 Geothermal systems are able to tap into this free energy with an earth loop. This technology is then used to provide your home or office with central heating and cooling. In the cooling mode, the heating process is reversed - creating cool, conditioned air throughout the home. Instead of extracting heat from the ground, heat is extracted from the air in your home and either moved back into the earth loop, or used to preheat the water in your hot water tank. This image is operating in the cooling mode. The heat pump absorbs the heat from the air in the house, then rejects the heat into the water loop that is then circulated outside to the boreholes. The relatively constant 50 degree temperature of the ground allows the heat to be rejected into the ground. So in essence the water is cooled before returning to the house to start the process all over again. Studies show that about 70 percent of the energy used in geothermal systems is renewable energy from the ground. The constant temperatue of the grounds makes geothermal so practical for today's world. According to the environmental protection agency, geothermal systems can reduce your energy bills 30-40 percent. Not only that, if you choose to install a desuperheater, it can heat your domestic household water. In the winter the desuperheater can reduce water-heating costs by half.